The Declaration of Breda paved the way for Charles II's return from exile in The Hague and his Restoration the following month. 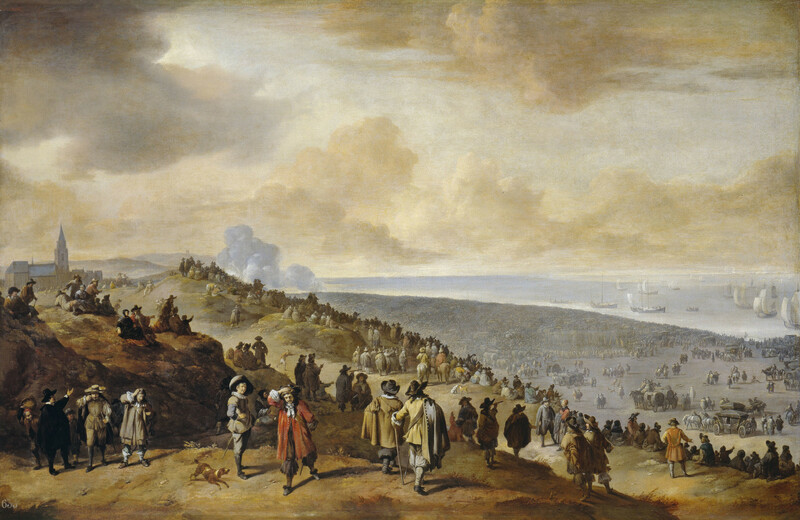 This scene captures the pomp and ceremony of the king's departure on 23 May 1660 from Scheveningen in the Netherlands, where he boarded the newly renamed ship, the Charles (previously the Naseby), with his two brothers, James, Duke of York, and Henry, Duke of Gloucester (1640–60), and set sail for Dover. The exiled Prince had lived in The Hague since 1648, the home of his sister Mary and (until his death in 1650) her husband William II, Prince of Orange. This scene carefully conveys the vast expanse of beach and the huge crowds of spectators who came to see the restored English King set sail for his homeland. As one eyewitness recorded, 'Never have more people been seen together in Holland.' The same scene is represented in more pedantic detail by an anonymous painting (RCIN 405163) copied from a contemporary print. Lingelbach takes a more picturesque and oblique view from the dunes, with the village of Scheveningen to the left. The landscape dramatically undulates, with each step towards the horizon indicating more viewers. Rather than focusing on an identifiable figure of Charles II with his retinue, the artist purposefully focuses on the spectacle, highlighting the reaction of the people gathered on the beach and dunes. The clouds in the sky are matched by clouds of smoke from a gun salute, the noise of which causes the men in the foreground left to cover their ears. The mixture of costumes from expensive high-fashion fabrics to simple garments implies the spectrum of society gathered to witness the event. Some of the figures sit contentedly on high ground, settling down for the show, while others strain, one even using the relatively new technology of a telescope, to gain a better view.